Jim Young/ReutersA demonstrator marches through the streets during a protest marking the 100th day since the shooting death of Michael Brown in St. Louis, Missouri November 16, 2014. Residents of a St. Louis suburb were braced on Saturday for a decision from a grand jury on whether to bring charges against a white police officer for fatally shooting a black teen, a case that has triggered months of demonstrations and a national debate over police violence. With a grand jury verdict expected at any time, protest leaders and police in Ferguson, Missouri, have been taking steps to avert more street violence, especially if officer Darren Wilson is not indicted in the Aug. 9 slaying of 18-year-old Michael Brown. Wilson has said he shot in self defence while Brown’s companion has said the teen had his hands raised and was trying to surrender. On Saturday, the dead teenager’s father, Michael Brown, and some of the family’s supporters handed out Thanksgiving turkeys to residents in the street where his son was gunned down. Many residents were surprised when he knocked on their doors. 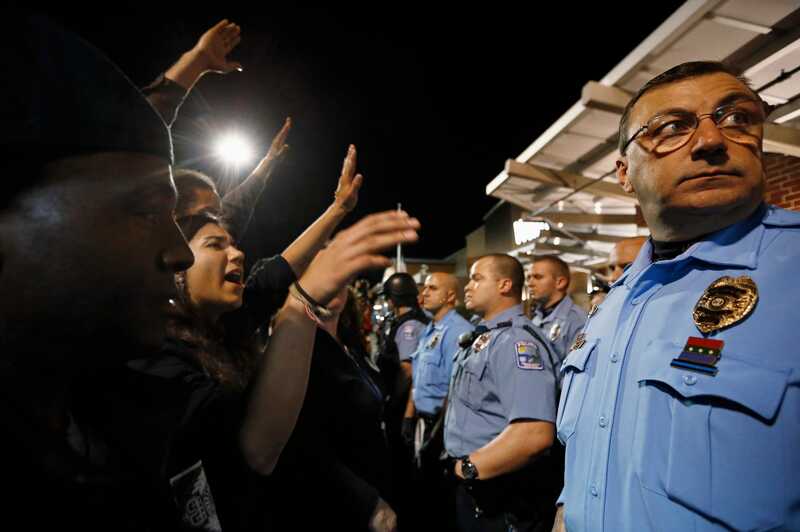 Jim Young/ReutersProtesters take part in a demonstration in front of police officers at a Walmart store in St. Louis, Missouri, October 13, 2014. She smiled and waved back, yes. 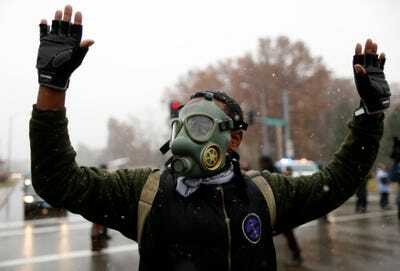 St. Louis prosecutors have said they will hold a news conference to announce the outcome of the grand jury, although the date, time and location remained undetermined. The 12-member panel met behind closed doors again on Friday. Anthony Grey, an attorney for the Brown family, told reporters on Friday that the deliberations could last an hour, a day, a week, or a month. “No one can forecast when that decision will actually be reached,” Grey said. The killing instantly became a flashpoint for strained U.S. race relations, triggering weeks of sometimes violent protests in Ferguson calling for the arrest of Wilson. He has instead been placed on administrative leave and gone into seclusion. Missouri Governor Jay Nixon has declared a state of emergency and called in National Guard troops to back up police. Groups across the country have said they would take to the streets again in large numbers if charges are not brought.